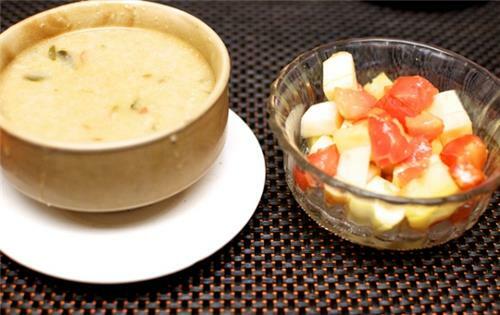 Foodies in the southern metropolis of Chennai are exhilarated! And understandably, it is not the time to question them why, but it is time for celebrations. 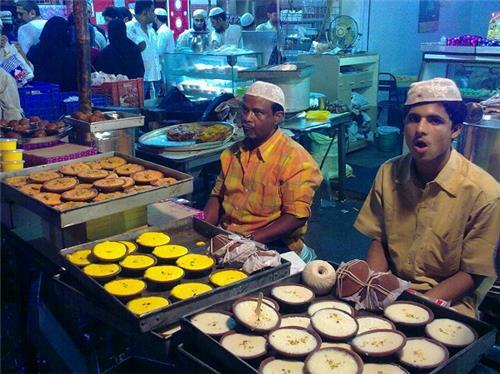 With Eid-ul-Fitr around the corner (the special day that marks the end of the holiest Islamic month of Ramadan), every street and every road in the bustling city is wafting with the mesmerizing aroma of dakhni delicacies. Beyond any doubt, the holiest period for the Islamic faith (Ramadan) is all about self-discipline, humanity and attaining spirituality. 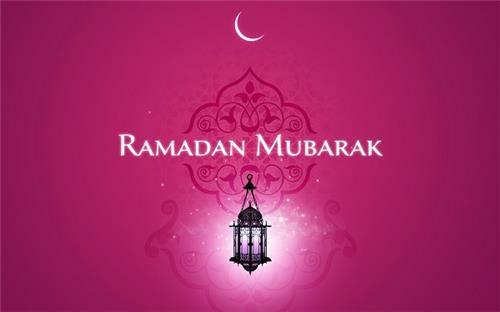 But then, when it is about food, the warm and hospitable people of Chennai, come together to enjoy the delectable Ramzan treats. A wide range of specialty recipes from across the country make a debut every year during this festive season, giving a touch of diverseness to the food culture that Ramzan bestows. Typically, Chennai Muslims break their fasting with a wholesome porridge, fondly called as 'nombu kanji' in the local language of Tamil. Nombu kanji is more or less similar to usual porridge but filled with a lot of cereals and pulses. Although, fast food is more and more turning the flavor of this festive season, age old custom and tradition is esteemed and treasured in Muslim households across the country. 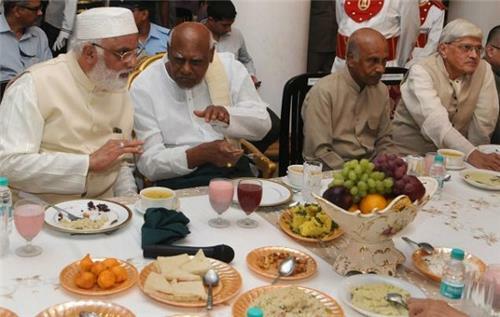 Prior to the invasion of Haleem, nombu kanji was one of the widely followed means of ending the fast, among the Chennai Muslims. Today, people follow almost three ways to break the fast. The south Indian way of ending the fast with nombu janji and vathalappam (a specialty dessert), the north Indian way involving kabab and kurma and finally, the Hyderabadi way where luxuriant dishes prepared with the lavish use of saffron are taken. Numerous restaurants in Chennai who are willing to serve the special needs and demands of people during this festive season, have come up with extended menu, exclusive stalls, unique spreads, Iftar buffet and many more. From Hyderabadi Haleem to Qubani Ka Meeta, Mutton Samosa to Hyderabadi Dum Biryani, Shawarma to Kebab, what not, restaurants in Chennai have certainly rose to the festive occasion. Let's glance through some of the best eating places in Chennai to visit during Ramzan that will make Gastronomists say mmmmmmmmmmmmmm! A popular eating place that specializes in authentic Arabian food, BBQ, Indian and Chinese delicacies to treat the taste buds. 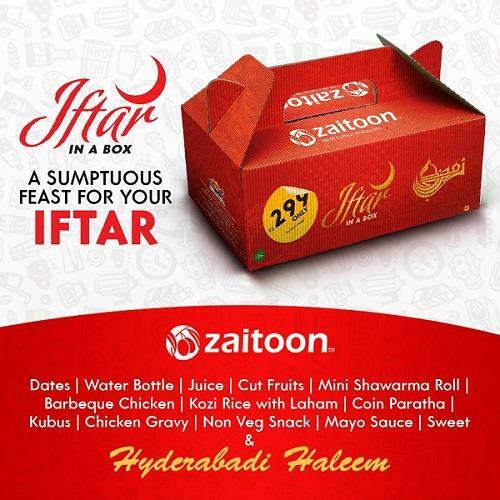 The special 'Iftar in a box' offered by the Zaitoon include dates, juice, cut fruits, coin paratha, kubis, barbeque chicken, mini shawarma roll, mayo sauce, sweet, kozi rice with laham, non veg snack, water bottle and in addition to Hyderabadi Haleem. The Iftar kit is priced at Rs. 299 and for this price tag, the Iftar in a box from Zaitoon is a luxurious spread! 13/33, Shafee Mohammed Road, Opposite to Apollo Children’s Hospital. Located just opposite to the Kovai Pazhamudhir Nilayam and Eswari Lending Library in Gopalapuram, Charminar Restaurant offers two options, an Iftar buffet and Iftar combo. A truly sumptuous feast that Iftar specialty at Charminar includes dates, sherbet, Hyderabadi Haleem, Irani chai, kheema samosa, kebabs, chapathi, Karachi biscuits, sweet and Biryani. It is important to mention that the Charminar Restaurant is providing a dedicated space to offer prayers a spacious Iftar party hall. A big name among the most popular restaurants in the city of Chennai, Savoury Sea Shell has several branches across the city to serve the taste-needs of the foodies. 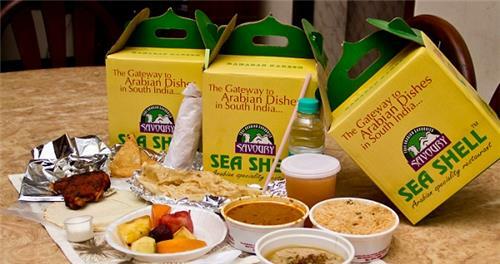 Specializing in Arab, Kebab, Chinese, Seafood and Tandoori delicacies, Savoury Sea Shell Family Restaurant came out with a salubrious Iftar spread this year, which comprises of water bottle, cut fruits, juice, Hyderabadi Haleem, shawarma, mutton gravy, Biryani, parotta, khuboos, toum, grilled chicken. Fondly known as Blue Diamond among Chennai people, the Jewel Box Restaurant in Chennai is singular in its own way that it is the probably the only restaurant in all of Chennai to serve the traditional nombu kanji. It is significant that apart from the scores of mosques dotted all over the city, the Blue Diamond is the only place among the restaurants that offer authentic nombu kanji that come with the exclusive Iftar combo served. 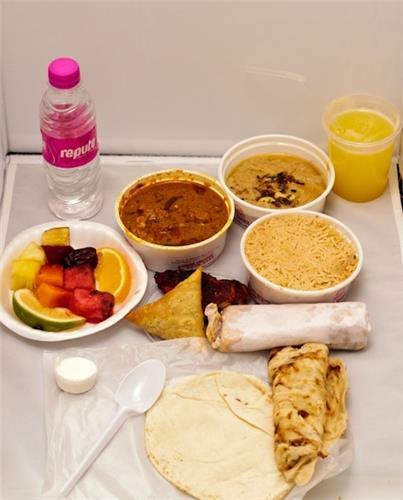 The specialty combo comprises of nombu kanji, cut fruits, egg gravy, dates, chicken 65, juice and parotta. One of the most visited restaurants during the festival season of Ramadan, The Fisherman's Fare is known for its mouth watering Haleem. Believably, the first place to introduce Haleem in Chennai, the Fisherman's Fare Haleem is traditional and authentic in taste and flavour. 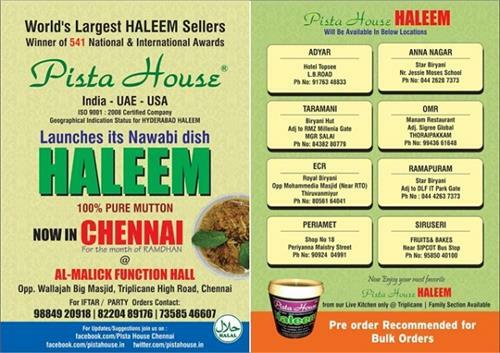 They also offer Chicken Haleem apart from the most ordered mutton version. The Iftar buffet offered at this restaurant is one thing to die for. It comprises of dum ka chicken, a variety of pakoras, samosa, shawarma rolls, lugmi, and kebabs and so on. Located on TTK Road, right opposite to the Samsung showroom, Spoonbill Restaurant specializes in a variety of cuisines and amazes the guests with dishes that cannot be enjoyed anywhere else in the city of Chennai. 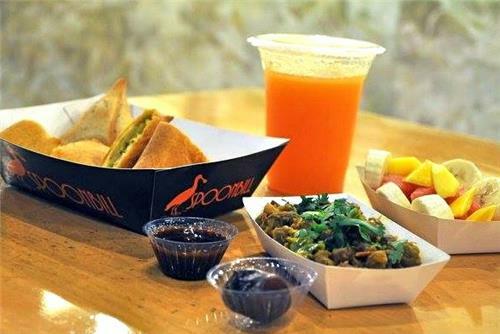 The Iftar platter offered by the Spoonbill Restaurant come with a healthy choice of items which include dates, juice, aloo bread pakora, mutton samosa, cut fruits, chicken empanada, masala chana. The Iftar platter at the Spoonbill restaurant is priced at Rs. 230. 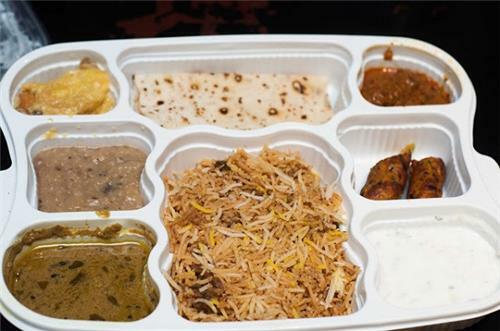 They also offer the specialty platter for takeaway. A celebrated place that can be considered as a bakery that offers a range of sweets and bakery items is renowned for its Haleem. The joint has earned a distinguished name over the years for its authentic Haleem which is made of meat and pure ghee blended with the right amount of dry fruits, spices, wheat and drawn butter. Priced at Rs. 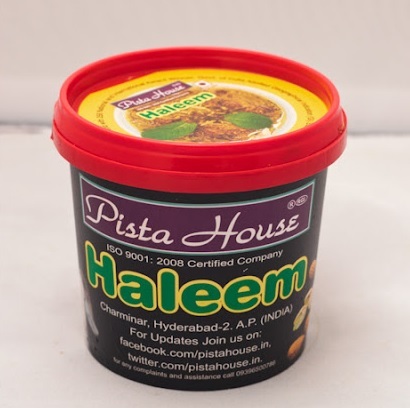 725 per kg, Pista House's Haleem will make you melt in no time, with its rich taste! For door delivery in Chennai, call @ 1800-266-4284.